George Washington Houghtailing (April 7, 1817 – September 2, 1887,) a Dutchman from the Hudson-Mohawk Valley in New York, came to Hawai‘i around 1845. His first wife died after their daughter Sara was born (Sara married Jerome Feary.) Houghtailing remarried (Elizabeth Thompson) and had ten more children (5-boys and 5-girls,) nine of whom lived to adulthood. During the Māhele, he was given several kuleana, later consolidated into a 15-acre tract along a road later named after him, Houghtailing Road. The family home was between School and Vineyard Streets. Mr. Houghtailing located the ponds, taro fields, and rice patches from School Street to Liliha Street; other taro patches were in the area “between Pālama Street and Liliha Street, below School Street down to what in now Vineyard Street”. The rice ponds and taro patches, usually operated by the Chinese, were cultivated up to the 1920s, when many were filled in for the development of residential subdivisions. The Japanese took over some of the land as truck farms, and the Japanese also gradually took over the small stores once operated by the Chinese. Additionally, the development of one of the first subdivision, the McInerny Tract was developed around 1918-1920. At the end of World War II, the Catholic Diocese of Honolulu saw the need for a second Catholic School on Oʻahu. The new school was named after Saint Damien de Veuster. The Congregation of Christian Brothers, students, and parents volunteered to turn the land, which included 4-acres of taro patches and a good deal of uneven swampland into a school campus, because the company that started the construction on Damien went bankrupt. Damien Memorial School is now situated on what was part of the Houghtailing homestead in Kapālama. Regarding the name, the theory is that all Houghtailings and various spellings in the United States are descended from Conrad Mathias Houghtaling who emigrated from the Netherlands around 1650. The image shows an advertisement for the Bay Horse Hotel (Polynesian, May 16, 1895.) In addition, I have added other related images in a folder of like name in the Photos section on my Facebook and Google+ pages. Likewise, laws in place gave the Superintendent of Public Works the right to make Improvements to property which had been condemned as insanitary by the Board of Health. Also in 1906, the US War Department acquired more than 70-acres in the Kālia portion of Waikīkī for the establishment of a military reservation to be called Fort DeRussy. Back then, nearly 85% of present Waikīkī was in wetland. The Army started filling in the fishponds and wetland that covered most of the Fort site – pumping fill from the ocean continuously for nearly a year in order to build up an area on which permanent structures could be built. Thus, the Army began the transformation of Waikīkī from wetlands to solid ground and it served as a model that others followed. This set into motion a number of reclamation and sanitation projects in Kakaʻako, Honolulu, Waikīkī, Lāhaina, Hilo and others. The first efforts were concentrated at Kakaʻako – it was then more generally referred to as “Kewalo.” The Kewalo Reclamation District included the area bounded by South Street, King Street, Ward Avenue and Ala Moana Boulevard. This area already had a practical demonstration of dredging and filling. In 1907, the US Army Fort Armstrong was built on fill over Kaʻākaukukui reef to protect the adjoining Honolulu Harbor. 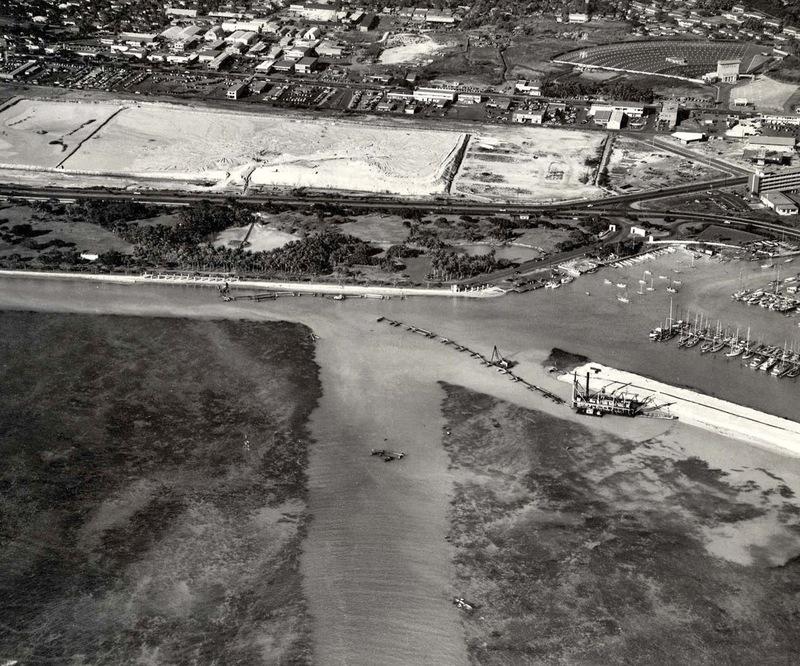 Kapālama Reclamation Project included approximately 60-acres of land between King Street and the main line of Oʻahu Railway and Land Company. In addition, approximately 11-acres of land were filled from dredge material between Piers 16 and 17. The dredge material not only filled in the Waikīkī wetlands, it was also used to fill in the McKinley High School site. The initial planning called for the extension of the Ala Wai Canal past its present terminus and excavate along Makee Island in Kapiʻolani Park, connecting the Canal with the ocean on the Lēʻahi side of the project. However, funds ran short and this extension was contemplated “at some later date, when funds are made available”; however, that never happened. Eleven-and-a-half acres of Lāhaina “swamp land” (near the National Guard Armory,) drainage canals and storm sewers were part of the Lāhaina Reclamation District. (1916-1917) Mokuhinia Pond was filled with coral rubble dredged from Lāhaina Harbor. By Executive Order of the Territory of Hawaiʻi in 1918, the newly-filled pond was turned over to the County of Maui for use as Maluʻuluʻolele Park. Generally, the consensus was the reclamation projects were successful in addressing the health concerns; in addition, they made economic sense. As an example, in Waikīkī, before reclamation assessed values for property were at about $500 per acre and the same property reclaimed at ten cents a foot, making a total cost of $4,350 per acre. The selling price after reclamation, $6,500 to $7,000 per acre, showed the financial benefit of the reclamation efforts. The image shows Hawaiian Dredging around the Ala Wai Boat Harbor (and the end of the Ala Wai Canal.) In addition, I have added related images in a folder of like name in the Photos section on my Facebook and Google+ pages. Princess Ruth Keʻelikōlani inherited all of the substantial landholdings of the Kamehameha dynasty from her brother, Lot Kapuāiwa; she became the largest landowner in the islands. She was reared with her parent’s hānai child, Lydia Liliʻu Kamakaʻeha (birth daughter of High Chiefess Analeʻa Keohokālole and High Chief Caesar Kaluaiku Kapaʻakea, who later became Queen Liliʻuokalani.) The two girls developed a close, loving relationship. They attended the Chief’s Children’s School, a boarding school, together, and were known for their studious demeanor. Bernice Pauahi Bishop’s will (Clause 13) states her desire that her trustees “provide first and chiefly a good education in the common English branches, and also instruction in morals and in such useful knowledge as may tend to make good and industrious men and women”. On November 4, 1887, three years after her death, the Kamehameha School for Boys, originally established as an all-boys school on the grounds of the current Bishop Museum, opened with 37 students and four teachers. A year later the Preparatory Department, for boys 6 to 12 years of age, opened in adjacent facilities. In 1894 the Kamehameha School for Girls opened on its own campus nearby. Between 1930 and 1955, all three schools moved to its present location – Kapālama Heights – less than a mile mauka of the old Bishop Museum campus. In 1965 the boy’s and girl’s campuses became co-ed and the curriculum was increasingly geared to college preparation. On December 19, 1897, a new campus chapel dedication took place on the sixty-sixth anniversary of Bernice Pauahi Bishop’s birth. KS scholars, teachers, administrators and community representatives filled the whole building. Reverend William Brewster Oleson (1851–1915), former principal of the Hilo boarding school (founded by David Belden Lyman in 1836,) helped organize the schools on a similar model. At the first Founder’s Day ceremony in December, 1889, Charles Reed Bishop, Pauahi’s husband and a member of Kamehameha’s first Board of Trustees, elaborated on her intentions. In 1996 two new campuses were established on the neighbor islands of Maui and Hawai‘i, and they now serve students in grades K-12. The three campuses enroll about 5,400 students and an additional 40,000 are served annually through community-based and scholarship programs, and collaborations with educational and community organizations. Kamehameha subsidizes a significant portion of the cost to educate every student. Although modest tuition and fees are charged, nearly 60 percent of preschool and K-12 families qualify for and receive need-based financial aid. The image shows a pre-1900 image of the Kamehameha School for Boys, the beginning of the Kamehameha Schools system (KSBE.) In addition, I have added other images in a folder of like name in the Photos section on my Facebook and Google+ pages.